In a recent paper, we analyzed affiliate marketing on YouTube and Pinterest. We found that on both platforms, only about 10% of all content with affiliate links is disclosed to users as required by the FTC’s endorsement guidelines. One way to improve the situation is for affiliate marketing companies (and other “influencer” agencies) to hold their registered content creators to the FTC’s endorsement guidelines. To better understand affiliate marketing companies’ current practices, we examined the terms and conditions of eleven of the most common affiliate marketing companies in our dataset, and specifically noted whether they required content creators to disclose their affiliate content or whether they mentioned the FTC’s guidelines upon registration. The table above summarizes our findings. All the terms and conditions were accessed May 1, 2018 from the affiliate marketing companies’ websites. We did not hyperlink those terms and conditions that were not available publicly. All the companies that required disclosure also mentioned the FTC’s endorsement guidelines. Out of the top 10 programs in our corpus, only 3 explicitly instructed their creators to disclose their affiliate links to their users. In all three cases (Amazon, Ebay, and ShopStyle), the companies called out the FTC’s endorsement guidelines. Of particular interest is Amazon’s affiliate marketing terms and conditions (Amazon was the largest affiliate marketing program in our dataset). Amazon’s terms and conditions: When content creators sign up on Amazon’s website, they are bound by the programs terms and agreements Section 5 titled: “Identifying Yourself as an Associate”. Figure 1: The disclosure requirement in Section 5 of Amazon’s terms and conditions document. As seen in Figure 1, the terms of Section 5 do not explicitly mention the FTC’s endorsement guidelines but constrain participants to add only the following disclosure to their content: “As an Amazon Associate I earn from qualifying purchases”. In fact, the terms go so far as to warn users that “Except for this disclosure, you will not make any public communication with respect to this Agreement or your participation in the Associates Program”. However, if participants click on the “Program Policies” link in the terms and conditions—which they are also bound to by virtue of agreeing to the terms and conditions—they are specifically asked to be responsible for the FTC’s endorsement guidelines (Figure 2): “For example, you will be solely responsible for… all applicable laws (including the US FTC Guides Concerning the Use of Endorsement and Testimonials in Advertising)…”. Here, Amazon asks the content creators to comply with the FTC’s guidelines, without exactly specifying how. It is important to note that the FTC’s guidelines themselves do not enforce any specific disclosure statement constraints on content creators, but rather suggest that content creators use clear and explanatory disclosures that convey the advertising relationship behind affiliate marketing to users. Figure 2: The disclosure requirement from Amazon’s “Program Policies” page. We learned about these clauses from the coverage of our paper on BBC’s You and Yours podcast (~ 16 mins in). A YouTuber on the show pointed out that he was constrained by the Amazon’s clause to not disclose anything about the affiliate program publicly. Indeed, as we describe in the above sections, Amazon’s terms and conditions seem contradictory to their Program Policies. On the one hand, Amazon binds its participants to the FTC’s endorsement guidelines but on the other, Amazon severely constrains the disclosures content creators can make about their participation in the program. Further, researchers are still figuring out which types of disclosures are effective from a user perspective. Content creators might want to adapt the form and content of disclosures based on the findings of such research and the affordances of the social platforms. For example, on YouTube, it might be best to call out the affiliate relationship in the video itself—when content creators urge participants to “check out the links in the description below”—rather than merely in the description. The rigid wording mandated by Amazon seemingly prevents such customization, and may not make the affiliate relationship adequately clear to users. Affiliate marketing companies wield strong influence over the content creators that register with their programs, and can hold them accountable to ensure they disclose these advertising relationships in their content. At the very least, they should not make it harder to comply with applicable laws and regulations. Is affiliate marketing disclosed to consumers on social media? 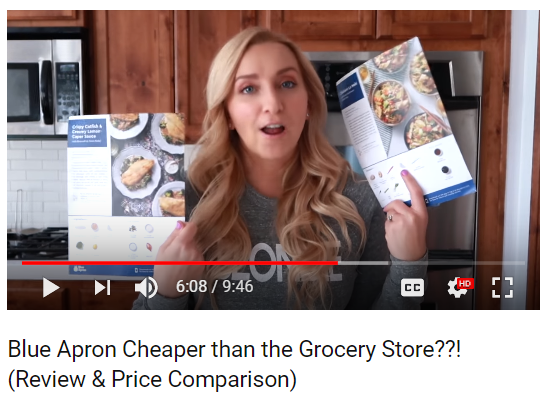 The video reviews Blue Apron—an online grocery service—describing how it is efficient and cheaper than buying groceries at the store. 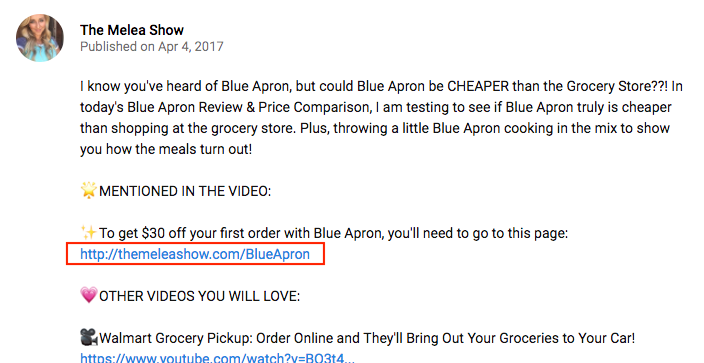 The description of the video has a link to Blue Apron which gets you a $30 off your first order, a seemingly sweet offer. The video’s description contains an affiliate link (marked in red). What you might miss, though, is that the link in question is an “affiliate” link. Clicking on it takes you through five redirects courtesy of Impact—an affiliate marketing company—which tracks the subsequent sale and provide a kickback to the YouTuber, in this case Melea Johnson. YouTubers use affiliate marketing to monetize their channels and support their activities. This example is not unique to YouTube or affiliate marketing. There are several marketing strategies that YouTubers, Instagrammers, and other content creators on social media (called influencers in marketing-speak) engage in to generate revenue: affiliate marketing, paid product placements, product giveaways, and social media contests. Endorsement-based marketing is regulated. In the United States, the Federal Trade Commission requires that these endorsement-based marketing strategies be disclosed to end-users so they can give appropriate weightage to content creators’ endorsements. In 2017 alone, the FTC sent cease and desist letters to Instagram celebrities who were partnering with brands and reprimanded YouTubers with gaming channels who were endorsing gambling companies—all without appropriate disclosure. The need to ensure content creators disclose will likely become all the more important as advertisers and brands attempt to target consumers on consumers’ existing social networks, and as lack of disclosure causes harm to end-users. Our research. In a paper that is set to appear at the 2018 IEEE Workshop on Consumer Protection in May, we conducted a study to better understand how content creators on social media disclose their relationships with advertisers to end-users. Specifically, we examined affiliate marketing disclosures—ones that need to accompany affiliate links—-which content creators placed along with their content, both on YouTube and Pinterest. How we found affiliate links. To study this empirically, we gathered two large datasets consisting of nearly half a million YouTube videos and two million Pinterest pins. We then examined the description of the YouTube videos and the Pinterest pins to look for affiliate links. This was a challenging problem, since there is no comprehensive public repository of affiliate marketing companies and links. However, affiliate links do contain predictable patterns, because they are designed to carry information about the specific content creator and merchant. For instance, an affiliate link to Amazon contains the tag URL parameter that carries the name of the creator who is set to make money from the sale. Using this insight, we created a database containing all sub-domains, paths and parameters that appeared with a given domain. We then examined this database and manually classified each entry either as affiliate or non-affiliate by searching for information about the organization owning that domain and sometimes even signing up as affiliates to validate our findings. Through this process, we compiled a list of 57 URL patterns from 33 affiliate marketing companies, the most comprehensive publicly available curated list of this kind (see Appendix in the paper, and GitHub repo). How we scanned for disclosures. We could expect to find affiliate link disclosures either in the description of the videos or pins, during the course of the video, or on the pin’s image. We began our analysis by manually inspecting 20 randomly selected affiliate videos and pins, searching for any mention about the affiliate nature of the accompanying URLs. We found that none these videos or pins conveyed this information. Instead, we turned our attention to inspecting the descriptions of the videos and pins. Given that any sentence (or phrase) could contain a disclosure, we first parsed descriptions into sentences using automated methods. We then clustered these sentences using hierarchical clustering, and manually identified the clusters of sentences that represented disclosure wording. Affiliate link disclosures: The first type of disclosures simply stated that the link was an “affiliate link”, or that “affiliate links were included”. On YouTube and Pinterest these type of disclosures were present on ~7% and 4.5% of all affiliate videos and pins respectively. Explanation disclosures: The second type of disclosures attempted to explain what an affiliate link was, on the lines of “This is an affiliate link and I receive a commission for the sales”. These disclosures—which are of the type the FTC expects in its guidelines—only appeared ~2% each of all affiliate videos and pins. Support channel disclosures: Finally, the third type of disclosures—exclusive to YouTube—told users that they would be supporting the channel by clicking on the links in the description (without exactly specifying how). These disclosures were present in about 2.5% of all affiliate videos. In the paper, we present additional findings, including how the disclosures varied by content type, and compare the engagement metrics of affiliate and non-affiliate content. Cause for concern. Our results paint a bleak picture: the vast majority of affiliate content on both platforms has no accompanying disclosures. Worse, Affiliate link disclosures—ones that the FTC specifically advocates against using—were the most prevalent. In future work, we hope to investigate the reason behind this lack of disclosure. Is it because the affiliates are unaware that they need to disclose? How aware are they of the FTC’s specific guidelines? Further, we are concluding a user study that examines the efficacy of these disclosures as they exist today: Do users think of affiliate content as an endorsement by the content creator? Do users notice the accompanying disclosures? What do the disclosures communicate to users? What can be done? Our results also provide several starting points for improvement by various stakeholders in the affiliate marketing industry. For instance, social media platforms can do a lot more to ensure content creators disclose their relationships with advertisers to end-users, and that end-users understand the relationship. Recently, YouTube and Instagram have taken steps in this direction, releasing tools that enable disclosures, but it’s unlikely that any one type of disclosure will cover all marketing practices. Similarly, affiliate marketing companies can hold their registered content creators accountable to better standards. On examining the affiliate terms and conditions of the eight most common affiliate marketing companies in our dataset, we noted only two explicitly pointed to the FTC’s guidelines. Finally, we argue that web browsers can do more in helping users identify disclosures by means of automated detection of these disclosures and content that needs to be disclosed. Machine learning and natural language processing techniques can be of particular help in designing tools that enable such automatic analyses. We are working towards building a browser extension that can detect, present and explain these disclosures to end-users. Freedom to Tinker is hosted by Princeton's Center for Information Technology Policy, a research center that studies digital technologies in public life. Here you'll find comment and analysis from the digital frontier, written by the Center's faculty, students, and friends.